Installing fence posts - Let us at A Better Fence Construction do it for you! 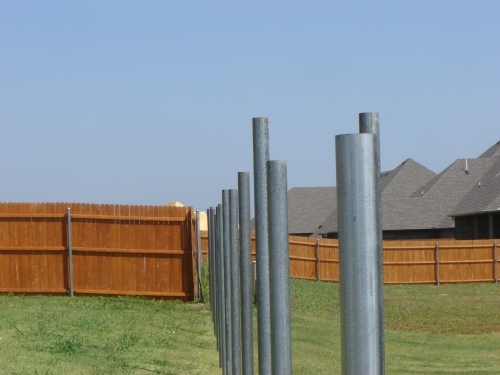 We go about installing fence posts in a way that ensures you get a great looking fence line. Our poles are leveled three ways, including the top of the poles, side-to-side, and in-line. Poles are driven deep and set in concrete. Our poles are installed to the same level or with a gentle slope with the contour of the land and not cut; increasing the time your fencing stays perfectly straight. The only time we may not install them to the same depth is when there is a concern for very near underground utilities. 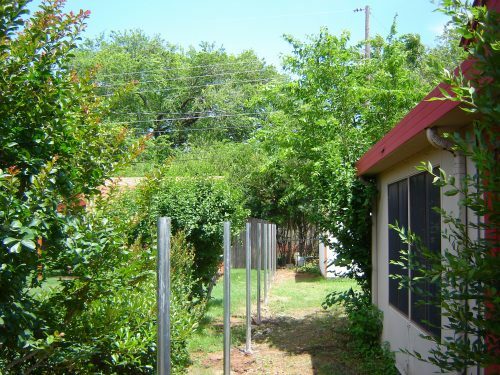 Our heavy duty, galvanized steel poles are precise across the tops, side-to-side, and in-line. See how we set the steel posts to the same level across the tops? However, some companies go about quickly installing a steel pole without much care for its accuracy across the top or in-line. See below how a competitor did not take the time installing their posts accurately across the tops and in-line? These posts are already “setting” up in the concrete and will either be capped as is or the tops will have to be cut off to not show above the top of the pickets. We make every effort not to cut the posts. Installing the whole post is stronger than installing 7/8ths of a pole right? More of the post that is in the ground helps your investment hold true over its lifetime.